Pitcher of Nepenthes distillatoria. A: Honey-gland from attractive surface of lid. B: Digestive fluid from interior of pitcher, in pocket-like depression of epidermis, opening downwards. C: Tranverse section same. The term "pitcher plant" generally refers to members of the Nepenthaceae and Sarraceniaceae families, but similar pitfall traps are employed by the monotypic Cephalotaceae and some members of the Bromeliaceae. The families Nepenthaceae and Sarraceniaceae are the most species-rich families of pitcher plants. The Nepenthaceae contains a single genus, Nepenthes, containing over 100 species and numerous hybrids and cultivars. In these Old World pitcher plants, the pitchers are borne at the end of tendrils that extend from the midrib of an otherwise unexceptional leaf. 'Old world' pitcher plants (genus: Nepenthes) are typically characterized as having reduced and symmetrical pitchers with a comprehensive waxy coating on the surface of the inner pitcher wall. The plants themselves are often climbers, accessing the canopy of their habitats using the aforementioned tendrils, although others are found on the ground in forest clearings, or as epiphytes on trees. The New World pitcher plants (Sarraceniaceae), which comprise three genera, are ground-dwelling herbs whose pitchers arise from a horizontal rhizome. In this family, the entire leaf forms the pitcher, as opposed to Nepenthaceae where the pitcher arises from the terminal portion of the leaf. The species of the genus Heliamphora, which are popularly known as marsh pitchers (or erroneously as sun pitchers), have a simple rolled-leaf pitcher, at the tip of which is a spoon-like structure that secretes nectar. They are restricted to areas of high rainfall in South America. The North American genus Sarracenia are the trumpet pitchers, which have a more complex trap than Heliamphora, with an operculum, which prevents excess accumulation of rainwater in most of the species. The single species in the Californian genus Darlingtonia is popularly known as the cobra plant, due to its possession of an inflated "lid" with elegant false-exits, and a forked "tongue", which serves to ferry ants and other prey to the entrance of the pitcher. The species in the genus Sarracenia readily hybridize, making their classification a complex matter. The Cephalotaceae is a monotypic family with but one genus and species, Cephalotus follicularis. This species has a small (2–5 cm) pitcher similar in form to those of Nepenthes. It occurs in only one location in southwestern Australia. A few species of bromeliads (Bromeliaceae), such as Brocchinia reducta and Catopsis berteroniana, are known or suspected to be carnivorous. Bromeliads are monocots, and given that they all naturally collect water where their leaves meet each other, and that many collect detritus, it is not surprising that a few should have been naturally selected to develop the habit into carnivory by the addition of wax and downward-pointing hairs. Nepenthes muluensis pitchers hang from tendrils. (cultivated plant). Most North American Pitcher plants belong to the genus Sarracenia. Cobra lilies (Darlingtonia californica) use window-like areolae to lure insects into their hollow leaves. The Australian Pitcher Plant is the only member of the Australian genus Cephalotus. Foraging, flying or crawling insects such as flies are attracted to the cavity formed by the cupped leaf, often by visual lures such as anthocyanin pigments, and nectar bribes. The rim of the pitcher (peristome) is slippery when moistened by condensation or nectar, causing insects to fall into the trap. Pitcher plants may also contain waxy scales, protruding aldehyde crystals, cuticular folds, inward and downward pointing (retrorse) hairs, or guard-cell-originating lunate cells on the inside of the pitcher to ensure that insects cannot climb out. The small bodies of liquid contained within the pitcher traps are called phytotelmata. They drown the insect, whose body is gradually dissolved. This may occur by bacterial action (the bacteria being washed into the pitcher by rainfall), or by enzymes secreted by the plant itself. Furthermore, some pitcher plants contain mutualistic insect larvae, which feed on trapped prey, and whose excreta the plant absorbs. Whatever the mechanism of digestion, the prey items are converted into a solution of amino acids, peptides, phosphates, ammonium and urea, from which the plant obtains its mineral nutrition (particularly nitrogen and phosphorus). Like all carnivorous plants, they all grow in locations where the soil is too poor in minerals and/or too acidic for most plants to survive. Rather than relying on photosynthetic glucose to survive, pitcher plants supplement available nutrients and minerals (which plants normally obtain through their roots) with the constituents of their insect prey. Mature plants of Nepenthes lowii attract tree shrews (Tupaia montana), which feed on nectar that the plant produces but also defecate into the pitcher, providing nitrates and other nutrients. The plant and tree shrew have a symbiotic relationship. The rim of N. lowii is not slippery so that tree shrews can easily get in and out; it provides more nectar than other pitcher plants. The shape of the pitcher rim and the position of the nectar ensure that the animal's hindquarters are over the rim while it feeds. It is widely assumed pitfall traps evolved by epiascidiation (infolding of the leaf with the adaxial or upper surface becoming the inside of the pitcher), with selection pressure favouring more deeply cupped leaves over evolutionary time. The pitcher trap evolved independently in three eudicot lineages and one monocot lineage, representing a case of convergent evolution. 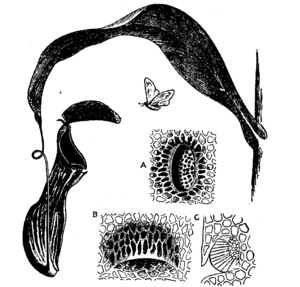 Some pitcher plant families (such as Nepenthaceae) are placed within clades consisting mostly of flypaper traps, indicating that some pitchers may have evolved from the common ancestors of today's flypaper traps by loss of mucilage. ^ a b Krol, E.; Plancho, B.J. ; Adamec, L.; Stolarz, M.; Dziubinska, H.; Trebacz, Kgv (2011). "Quite a few reasons for calling carnivores 'the most wonderful plants in the world". Annals of Botany. 109 (1): 47–64. doi:10.1093/aob/mcr249. PMC 3241575. PMID 21937485. ^ Moran JA, Clarke CM (2010). "The carnivorous syndrome in Nepenthes pitcher plants: current state of knowledge and potential future directions". Plant Signal Behav. 5 (6): 644–8. doi:10.4161/psb.5.6.11238. PMC 3001552. PMID 21135573. ^ Bauer, Ulrike, et al. "Form Follows Function: Morphological Diversification And Alternative Trapping Strategies In Carnivorous Nepenthes Pitcher Plants. "Journal of Evolutionary Biology 25.1 (2012): 90-102. MEDLINE with Full Text. ^ Lavergne, Sebastien; Ellison, Aaron M.; Butler, Elena D.; Hicks, Emily Jean; Naczi, Robert F. C.; Calie, Patrick J.; Bell, Charles D.; Davis, Charles C. (2012). "Phylogeny and Biogeography of the Carnivorous Plant Family Sarraceniaceae". PLoS ONE. 7 (6): e39291. doi:10.1371/journal.pone.0039291. ISSN 1932-6203. PMC 3374786. PMID 22720090. ^ McAlpine, D.K. (1998). "Review of the Australian stilt flies (Diptera: Micropezidae) with a phylogenetic analysis of the family". Invertebrate Taxonomy. 12 (1): 55–134. doi:10.1071/IT96018. ^ a b Albert, V.A. ; Williams, S.E. ; Chase, M.W. (1992). "Carnivorous Plants: Phylogeny and Structural Evolution". Science. 257 (5076): 1491–1495. doi:10.1126/science.1523408. PMID 1523408. ^ Owen Jr, T.P. ; Lennon, K.A. (1999). "Structure and Development of Pitchers from the Carnivorous Plant Nepenthes alta (Nepenthaceae)". American Journal of Botany. 86 (10): 1382–1390. doi:10.2307/2656921. PMID 10523280. ^ Pritchard; et al. (2002). "Evolutionary adaptations in pitcher plants". International Journal of Evolutionary Biology. 12 (3): 62–81. Chisholm, Hugh, ed. (1911). "Pitcher Plants" . Encyclopædia Britannica. 21 (11th ed.). Cambridge University Press. pp. 663–665. Juniper, B.E., R.J. Robins & D.M. Joel (1989). The Carnivorous Plants. Academic Press, London. Schnell, D. (2003). Carnivorous Plants of the United States and Canada. Second Edition. Timber Press, Oregon, U.S.A. Carnivorous plants can photosynthesise, so why eat flies? Wikimedia Commons has media related to Pitcher (plant).